There have been over 500+ international scientific studies. (See: National Library of Medicine - Type In Search Box: "Fucoidan". The results are in: Fucoidan is fantastic! All research done on Fucoidan indicates that it is completely safe to use and is nonallergenic; and it has no harmful effects on any bodily functions or organs. DISCLAIMER: The Food and Drug Administration has not evaluated these statements. 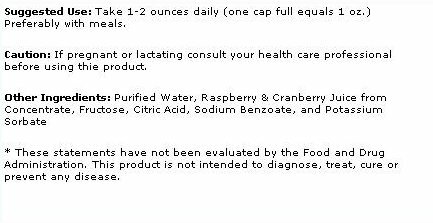 This product is not intended to diagnose, treat, cure or prevent any disease. Each capsule contains 500mg of concentrated Laminaria japonica (Brown Seaweed). Forty pounds of raw seaweed is needed to make one pound of LCR Fucoidan™. This is a dietary supplement made from the richest variety of wild-grown brown seaweed (Hoku Kombu), and is gathered by hands of divers in its natural habitat. The seaweed undergoes a special patented low-temperature process, which takes away the heavy outer fibers from the luscious leaves and essentially "predigests" the Laminaria to make LCR Fucoidan™ especially bio-available. This patented extraction technology makes bio-available the organic elements. Alginate: Natural absorbent of heavy metals. Detoxifies from lead, mercury, uranium and strontium. Alginate is classified as a hydrocolloid (a water-soluble biopolymer of colloidal nature when hydrated). Alginates are produced by brown seaweeds (Phaeophyceae, mainly Laminaria). Organic Iodine: Essential nutrient for a healthy life. Iodine obtained from kelp will not easily dissipate even after being heated for two hours, and it is more likely to be absorbed than inorganic iodine. Moreover, research on white rats proved that daily intake of 200 grams of organic iodine is safe. Laminarin: Laminaria Japonica Extract is made from the nutrient rich central vein of laminaria japonica; brown seaweed, and may help boost the immune system. Fucoidan: 40% Alginate. Fucoidan is a uniquely-structured sulfated polysaccharide (complex carbohydrate molecule) that is found in the cell walls of several types of brown seaweed, but not land plants. Its moisturizing property is what gives these seaweeds their slippery, sticky texture. LCR U-Fucoidan (U-fn) is unique as the temperature during processing and production does not exceed 176 degrees F. This is significant because unlike other seaweed products available on the market which are processed as high as 212 degrees F. This means the Fucoidan retains it's natural micro-elements because they are not broken down by high temperatures, and makes LCR Fucoidan the most powerful and effective seaweed product available. See: National Library of Medicine Type In Search Box: "Fucoidan". LCR Fucoidan is unique as the temperature during processing and production does not exceed 176 degrees F. This is significant because unlike other seaweed products available on the market which are processed as high as 212 degrees F. This means the Fucoidan retains it's natural micro-elements because they are not broken down by high temperatures, and makes LCR Fucoidan the most powerful and effective seaweed product available. 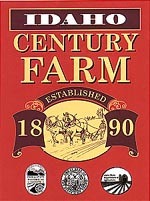 The brown seaweed in LCR Fucoidan is harvested from the clean, pristine waters of the northern Pacific ocean. Fucoidan has been tested worldwide, is bottled in the United States and is now available. Q. What is the difference between LCR Fucoidan and dried seaweed? Read on for more LCR Fucoidan information. With funding from the Bio-oriented Technology Research Advancement Institute (a special legal person under the joint jurisdiction of the Ministry of Agriculture, Fisheries and Forestry and the Ministry of Finance), Aomori prefecture, Hirosaki city, as well as eleven private sector companies, the Research Institute for a Glycotechnology Advancement was founded in February 1991. The Institute ranks as a research organization operating under the auspices of the Intelligent Research Institute, a body that was formed as part of the overall efforts to promote the development of the Tohoku (northeast) area. Fucoidan is highly branched sulfated polysaccharides based mainly on L-fucose units. Fucoidan is distributed in the intercellular matrix in brown algae. They have anticoagulant and antithrombotic effects by inhibiting thrombin and modulate some cytokine secretion by binding receptor on immune cells. In addition, antitumor activity of fucoidan is related to the activation of macrophage-mediated tumor cell killing and interferes cancer cell metastasis by inhibition of physical interaction between the tumor cell and basement membrane. The objective was to establish the extraction condition of fucoidan from sea mustard and to investigate which molecular size of fucoidan has more effect on the activation of murine macrophage P388D1. Fucoidan was extracted from sea mustard, Undaria pinnatifida, with different pH, temperature, and time. The extracted fucoidan was fractionated with hollow fiber type ultramembrane filter (MWCO; 3, 10, and 30 kDa) to obtain fucoidan with different molecular size. P388D1 was incubated for 5 days with different molecular size of fucoidans with different concentration (0.1-1000 µg/mL). Cell proliferation was assayed by Trypan blue staining and cytoxicity was measured by MTT assay. Cytokines were assayed by Enzyme-linked immunosorbent assay and Western blotting. Our results showed that, optimum extraction conditions for the extraction of fucoidans from sea mustard were estimated to be at pH 1.0 and temperature 70oC for 3 hr. In the presence of 1-1000 µg/mL, fucoidan fraction having 3-10 kDa of molecular size significantly increased cell proliferation (p<0.05). However, fucoidan fraction having 30 kDa of molecular size showed inhibition of cell growth. These results suggest that extraction conditions for fucoidan from sea mustard will be applicable for the production of fucoidan from the brown algae. Macrophage proliferation will contribute on the commercialization of fucoidan products. 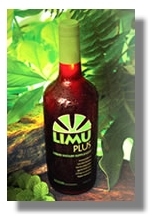 Type In Search Box - "Fucoidan"
But Limu Moui is no ordinary plant. In addition to being packed with the vitamins, minerals and other life-giving substances that have made kelp such a health food staple, limu moui is particularly rich in Fucoidan, which according to research may lend extraordinary support to the body’s immune functions. Adaptogens are a rare class of plant first identified by Russian scientists in their quest for the key to improved human performance. According to these researchers, they help restore the body’s overall capacity for exertion and resistance to stress. * As more people in the West learn about this exciting science, the interest in advanced adaptogens increases. 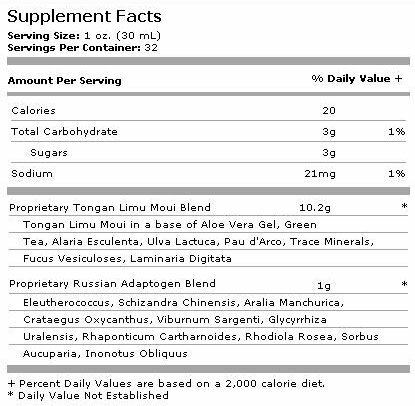 Recognizing the adaptogenic potential of Limu Moui, Vitacorp asked the question, "What would happen if we reinforced this traditional Tongan source of Fucoidan with a complex of advanced adaptogens? * The answer was a breakthrough product like no other!